"A delicious different way to have asparagus." Arrange pancetta on the prepared baking sheet. Bake in the preheated oven until pancetta is crispy, about 20 minutes. Remove pancetta to a cutting board and chop. Pour the drippings on the baking sheet into a skillet; add olive oil to skillet. Heat drippings and olive oil in the skillet over medium heat; cook and stir shallots, asparagus, tarragon, and pancetta in the hot drippings-oil mixture; season with salt and pepper. 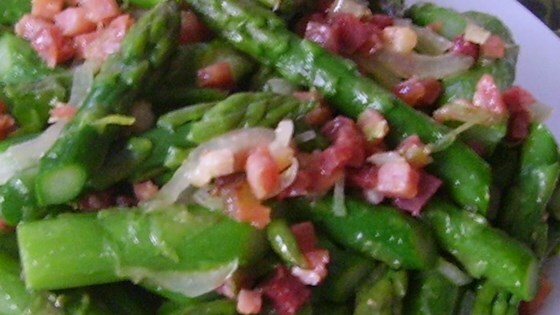 Cover skillet and cook until asparagus is tender, 15 to 20 minutes.